This is is my last post from Australia. I'll be leaving for the airport and the long trek back to the U.S. in an hour - leaving the land down under after a fabulous week at the T.R.A.F.F.I.C. Down Under conference on the gorgeous Gold Coast. While the conference officially closed Thursday night there was an optional activity day Friday when attendees could learn to surf in the morning and visit a great wildlife preserve (Currumbin Wildlife Sanctuary) in the afternoon. I saw a lot of really cool things this past week but nothing cooler than what you see in the pictures below - Thought Convergence COO Ammar Kubba shaving Fabulous.com COO Dan Warner's head Friday just before we headed to Currumbin. What was so cool about that? 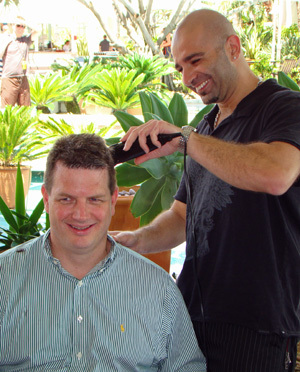 Dan's session with our favorite unlicensed barber helped raise AUD$25,000 (about $19,000 U.S.) for cancer research. It all started at the show's tropical island dinner party the night before when Kubba approached Warner about soliciting the crowd for a donation. 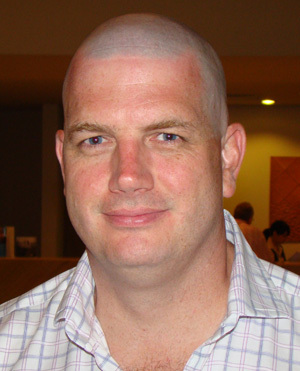 Warner (apparently after drinking several Dirty Dingos) told Kubba if he could get attendees to contribute $10,000 he would shave off all his hair. Kubba started working he crowd and within minutes he met the goal and over the next 24 hours it was far surpassed! Fabulous.com's Business Development Director Michael Robertson and domainer Merlin Kaufmann also helped fill up the pot - Robertson by getting his hair cut into a mohawk (which looks great by the way) and Kaufmann by allowing his beloved beard to go under the blade. Also, lest you think Kubba's contribution was limited to cheerleading and cutting Dan's hair (which he seemed to enjoy way too much) there's more. Ammar, whose head is already clean shaven, allowed the hair on his legs (and I'm talking about substantial foliage here) removed with wax strips. Ouch! I will have those photos as well as shots of Robertson and Kaufmann in our comprehensive show review article that will be published late next week. Kudos to this selfless quartet - all men with truly golden hearts. As for the job Fabulous.com did this week, they truly shined. Before the conference I said I knew they would do a great job staging their first show but even the highest expectations I had of them were far surpassed. I have more to say on that but it is time to head for the airport so I will save it for a review article you won't want to miss. It will includes tons of great photos and details that we were only able to skim in our daily Lowdown posts. I'll be back here with a new post from the States Monday. G'day Mates!